This is an original painting of the view of Breesy Hill from, outside Belleek, County Fermanagh. At only 846 feet high, Breesy is really a hill. Locals however, have always referred to it as a mountain owing to its appearance of prominence on the landscape from a distance. Breesy is a special place in the hearts of people in the local area and until recently had its own day called "Breesy Sunday" when people walked to the hill and enjoyed picnics and music at the top. 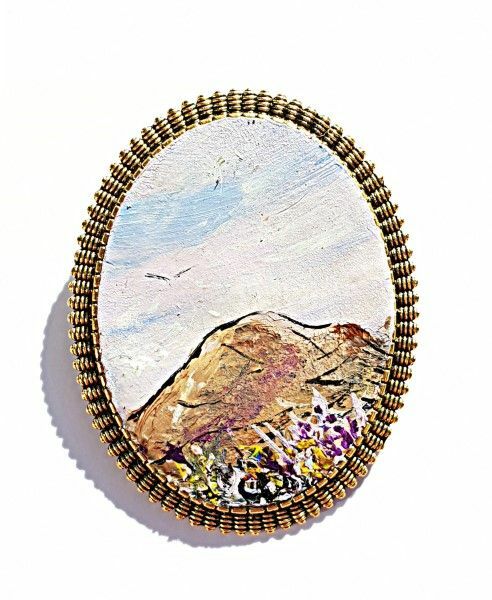 Caroline creates original miniature paintings on oven fired clay.